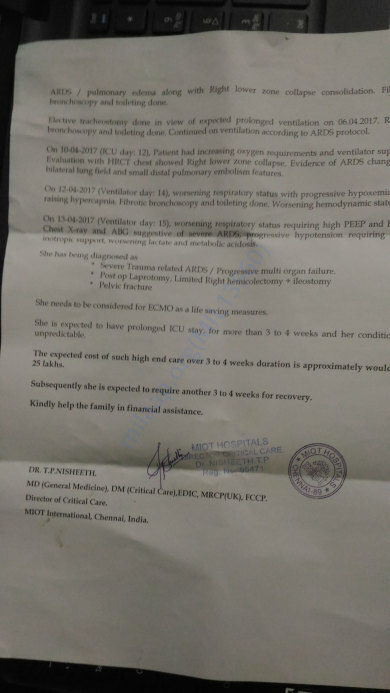 This is a request seeking financial help for a most deserving person met with a serious road accident. 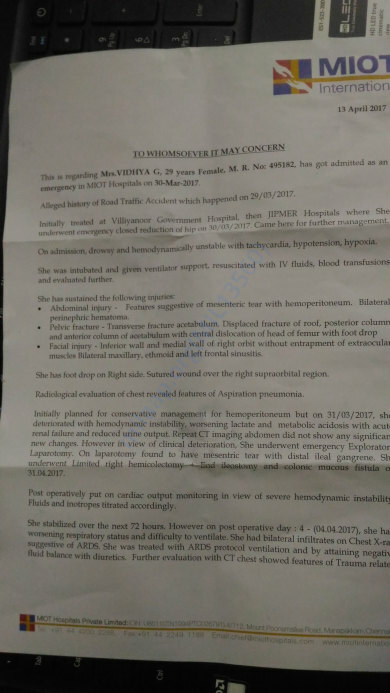 Mrs V.Vidya, aged 29 years, school teacher of Primary School in Pondicherry, w/o M.Gururajan, met with a road accident at Pondicherry on 29.3.2017 with multiple fractures and damage and after initial emergency treatment was shifted to MIOT Hospital in Chennai. The patient is still in critical condition and presently fighting her life in ECMO. About 15 lakhs has already been incurred/paid to the Hospital and the total hospital bill is expected to cross Rs. 50 lakhs, unbearable for a middle class family. Donations are kindly solicited to meet the medical expenses for the affected person. Will be grateful for any help / contribution. Will provide any additional information/document/photo required from the hospital. Will be immensely grateful for assistance. 132 A, Guru Nivas, 3rd cross, Tiruveni Nagar, Pondicherry 605 110. Thank you all for your wonderful support and wishes. 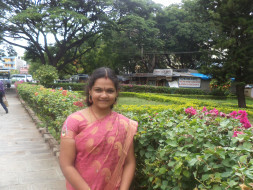 My wife is doing good and she is able to manage her work independently. She underwent another major operation in abdomen last January and now is recovering. Once again thank you for the support and wishes. Vidya has been admitted back for the abdomen surgery and she is doing well. This operation is for putting back the resected bowel back to the abdomen. Thank you for coming forward to help us. We will keep you posted on the progress. It gives me great joy to inform you that Vidya is at home and is recovering well. The doctors are planning to do another surgery in July for her intestines as a part of the post-treatment procedure after which she will be fine. Vidya has started eating well but still, needs support to walk and lift herself. It will take a year for her to fully recover but the doctors have given a positive feedback. Thank you so much for coming forward to help her. Keep sharing the campaign with your friends and family. This is sittapa sitti from pune.We pray to God for your speedy recovery.With blessings. My sincere prayers for your speedy and complete recovery.Even though my contribution is a meager amount my best wishes will always be with you to give you hope and energy to overcome the the difficult circumstance.